Surrounded by a busy lunch crowd during a campaign event at Ben’s Chili Bowl last month, Jack Evans touted his 22-year-history of revitalizing D.C. neighborhoods – name-dropping Nationals Park as a point of pride in the city’s economic development. “We really built the Convention Center, a Verizon Center, a baseball stadium. 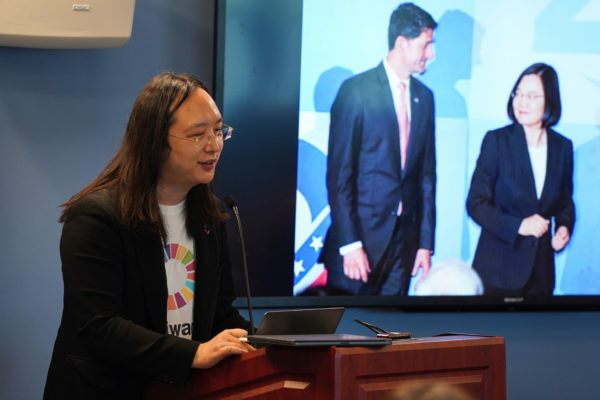 We have created a city that is really working,” said Evans, a mayoral candidate and D.C. Council member who represents Foggy Bottom. But economic experts who have studied publicly financed parks – like the $690 million Nationals Park – say D.C. lawmakers like Evans have overhyped the deal to score political points. The 41,000-seat stadium sits in an industrial neighborhood near Navy Yard and the District Department of Transportation. Though there are plans for more office space and apartment complexes, the area is currently an expanse of concrete punctuated with a Starbucks. 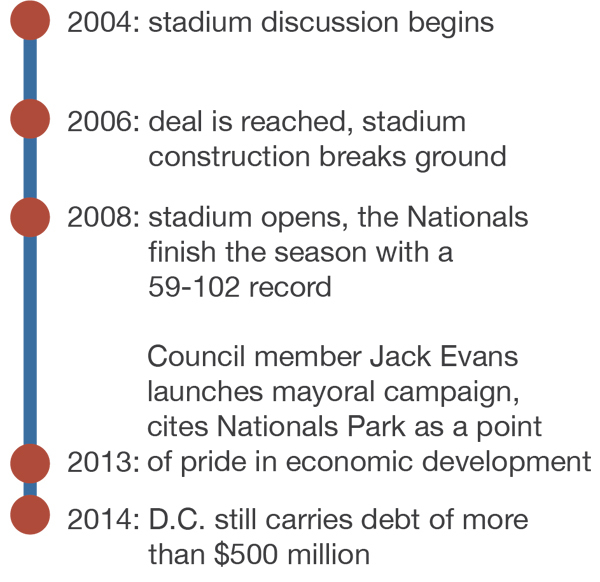 The deal for the stadium, which Evans helped negotiate on the D.C. Council, left the city with a gleaming baseball stadium but put D.C. more than $500 million in debt, which will take at least two decades to pay back. Though the area around the stadium, which sits on the banks of the Anacostia River, is improving, it mirrors booming development all over the city, Neil deMause, an author who researches city-funded stadiums said. “I don’t know if I’d want Nationals Stadium at the top of my resume,” deMause said. A high-end stadium in a developing neighborhood may attract more tourists to that area, but it won’t bring a net gain to the city, said Andrew Zimbalist, an economics professor from Smith College who has studied those types of deals. Evans, who also has a law practice in Georgetown, has strong connections to local businesses but may struggle to connect with voters across the city. A recent Washington Post poll showed Evans tied for third in the mayoral race with about two months remaining before the primary. “Those studies done are dead wrong on every front. They are hired guns for people who oppose these stadiums and their numbers never add up. Or, they are selective in the numbers they use,” Evans said. 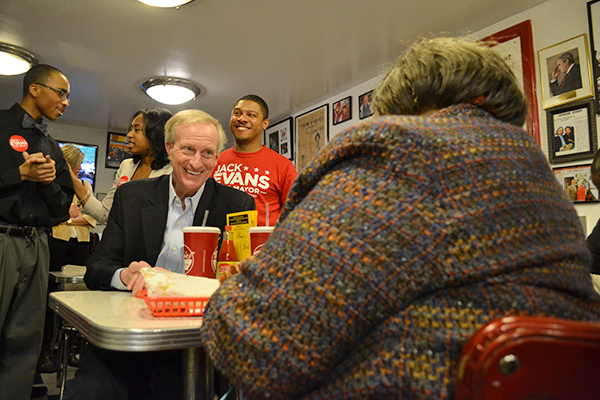 D.C. Council member Jack Evans at a recent campaign stop as he prepared for the April mayoral primary. 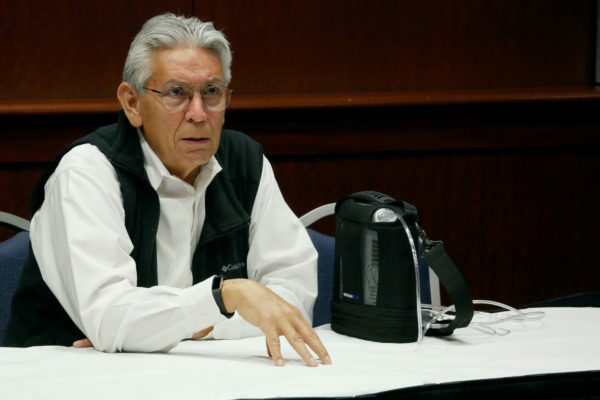 Evans said Thursday that he takes credit for the deal, which broke ground in 2006 after a series of dramatic public hearings. The final price tag made the stadium one of the most expensive of its kind. The city makes debt payments of about $38 million every year out of its billion-dollar budget. It also helps pay off the park by levying a specific ballpark fee on businesses in D.C. that make more than $5 million. The D.C. Council spent two years debating the deal, which was approved in 2006 after also being championed by former Mayor Anthony Williams. Four years before the deal was made, D.C. residents were about evenly split on the idea. Once construction began in 2006, costs – which included upgrades to the nearby Navy Yard Metro station and new sidewalks – ballooned to $80 million more than initial projections. Michael Stevens, director of the Capitol Riverfront Business Improvement District, said that though the area around the stadium is now seeing more businesses, development was slow to begin because of the financial crisis. The Nationals, brimming with young stars like outfielder Bryce Harper, have made it to postseason play once their in six years in the District. Last season the team underperformed, missing a playoff spot. A successful team is good news for the city’s budget. Concessions, ticket sales and merchandise purchased within the stadium are taxed at about 10 percent. The average ticket to a Nationals game is about $35.24, almost $8 above the league average. Dennis Coates, an economist from the University of Maryland Baltimore County, said teams and their owners are the main benefactors of stadium deals, especially stadiums with high-end bars and restaurants in the concourse. Principal owner Ted Lerner and three other Lerner family members with ownership stakes are all GW graduates. Evans said having a baseball team brings priceless “intangibles” like pride and excitement to the District.